Was the ship that had been slowly repaired, with new planks replacing rotten ones, still Theseus’ original vessel? As Plutarch notes, even at the time of the ship’s existence some believed it to be Theseus’ vessel, while others did not. There is an old joke about a farmer who said he had owned the same ax his whole life – he had only replaced the handle three time and the head twice! Is it still the same ax? What’s the oldest unchanged house in the world? Hint: It is made of a common material and lasts only one season. It is a house of water. Another riddle: The most rebuilt wooden structures in the world are the most unchanged. THE SAME SHIP, TWICE, THRICE…? In less than ten years after her construction in Boston, Constitution had already experienced significant re-building and repair work. Was she still the same ship? ACBS defines preserved boats as those containing at least 60% of their original deck and topsides material and is constructed using the same methods and materials as the original. Bottom replacement is expected in order for the boat to be serviceable but the method of replacement must duplicate the original…. The amount of original wood in a restored boat is not determinative. For example, the USS Constitution has essentially none of its original wood but we believe no one would consider it a replica. It is Old Ironsides. 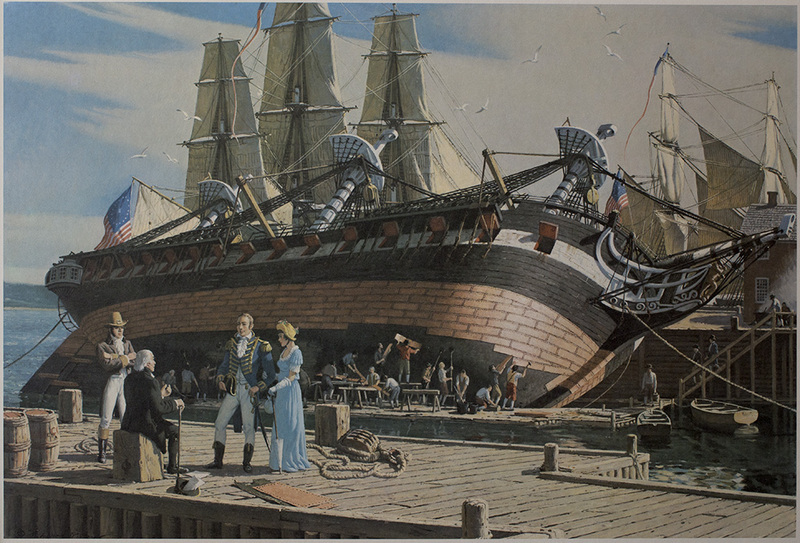 While Bonaparte was not inaccurate in his assessment of how little of the 1812 ship actually still existed in “Old Ironsides” by 1905, he gravely miscalculated the sympathies that the ship evoked for people. President Roosevelt, War of 1812 historian, passionate navalist, and a former assistant secretary of the navy, was one such sympathetic American. Roosevelt swiftly moved Bonaparte to attorney general where he (Bonaparte) helped to found the Federal Bureau of Investigation! Some monies were allocated and in 1906-1907, USS Constitution received her first “restoration” – a project with the intention of recreating an earlier era in the ship’s physical history. Despite an official name-change in World War I to “Old Constitution“, and significant structural changes over 220 years, the ship’s enduring identity, as a successful United States Navy warship, nicknamed “Old Ironsides”, has persisted. The U.S. Navy’s philosophy mirrors that of the Antique Classic Boat Society, the ship has always been Constitution and will always remain Constitution, regardless of how much or little 1790s materials exists in the ship’s structure. And so the Naval History & Heritage Command Detachment Boston continues with the maintenance and restoration of “Old Ironsides”. In the months since Constitution‘s re-float from Dry Dock 1 in late July, 2017, work has continued on the ship. Recently, the jibboom was completely replaced with a laminated Douglas fir spar and a new spritsail yard is underway. The jibboom that was removed from Constitution prior to the ship entering Dry Dock 1 in May, 2015, was manufactured in May, 2003, from laminated Douglas fir. It was refurbished in the 2007-2010 (floating) restoration and re-installed in 2010. The plan used for manufacturing the new jibboom was originally drawn for the 1927 restoration. Naval History & Heritage Command Detachment Boston ship restorer Kevin Mansfield manufactured the new jibboom from laminated Douglas fir. The new spritsail yard replaces a laminated Douglas fir spritsail yard that made for the 2007-2010 (floating) restoration and installed in June, 2010. Like the jibboom, a 1927 restoration plan and the 2010 spritsail yard are the guides for the work. The following photographs show the early stages of laying out the shape of the spritsail yard on the blank piece of laminated Douglas fir. The yard, when finished, will be 60 feet long. As spring arrives in Boston, the up-rigging and installation of spars on USS Constitution will continue so that the ship will be fully rigged for the 2018 summer season. The preservation and restoration of America’s Ship of State is an awesome responsibility. And unlike the Ship of Theseus, which had doubters as to its authenticity because of its lack of “original” material, few visitors to “Old Ironsides” today have any doubt that they are encountering history when they walk the ship’s decks and learn of the men who served aboard and sacrificed for their country. And if you’re wondering, the Naval History & Heritage Command Detachment Boston thinks there’s about 8 – 10% original material, dating from the ship’s building period (1794-1797), left in USS Constitution. This is not a scientific assessment, but more of an educated guess based upon records of past rebuilds and restorations.